Propelled by his own immigration experiences of coming from a vastly different culture, Salman Akhtar significantly updates his earlier work on the subject. 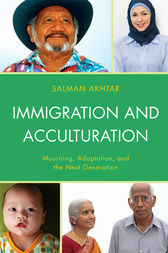 With a psychoanalytic sensitivity, a comprehensive use of the literature, and incisive interviews with other immigrants, Dr. Akhtar covers not only the usual traumas of immigration but also a font of new areas such as work and money, friendships, marriage and divorce, old age, and last but not least, the politically motivated false arguments against immigration. Salman Akhtar is professor of psychiatry at Jefferson Medical College and Training and Supervising Analyst at the Psychoanalytic Center of Philadelphia. His books include Immigration and Identity, Freud and the Far East, and The Crescent and the Couch.